Alright time to vent real quick. 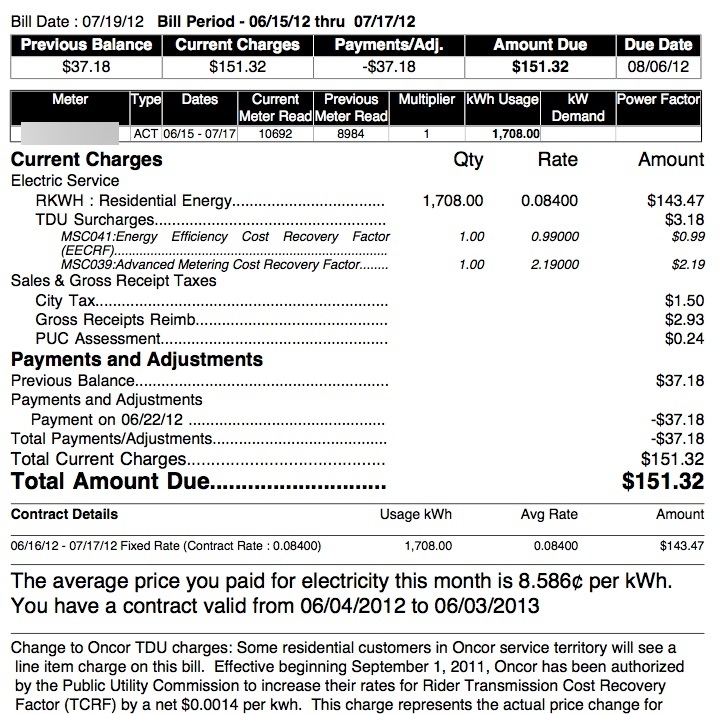 I’m all about supporting the environment, but two recent electric bills I’ve received have caused me to reconsider. 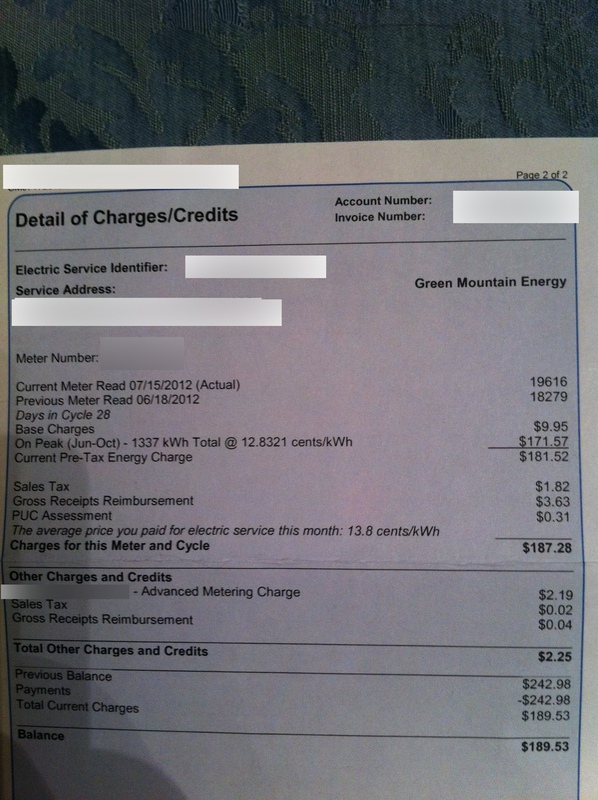 The rep at our apartment complex suggested Green Mountain Energy as a service provider last year. During the summer, the bills have been absolutely brutal. I kind of assumed our rate was competitive, then I saw the rate for the townhouse. 12.83 cents per kWh vs 8.4. That’s about 34%. Once you include the overall inefficiencies of the hvac unit in the apartment, poor window insulation and the fact that it was on the third floor I’m sure that it easily would add up to over 50%. I hate overpaying for things and electricity is no different. Just more proof to me that you need to shop around. Was supposed to go out with a friend tomorrow (the one with a expensive taste in restaurants) but the group of people at this event are really on the superficial side. Talking constantly about trips they’ve gone on, fancy places they’ve gone to eat at, etc. I personally don’t think we click much and would rather us not spend money to be with that group. We also went to a fun birthday party that ran a little over $100 for the both of us. I had 2 drinks after being pressured for drinking water with lemon, but the food and service were both top-notch. My folks are coming in from NY this week, so we made a last minute Ikea run as our guest bedroom has no bed or other furniture . Store was mobbed, but we did pick up a bed frame which was strategically placed on the roof of our Honda. By strategically I mean I was holding it on the roof with one hand, while my bf pulled on some strings that were tied to the roof. The high today was 106 and sweltering. Of all days to do it, this was probably the worst. I chipped in $150 of the low 200 bill. Next we went to a Mattress store. I am fine being gay, but at the same time the guy staring at me and my partner while we were trying out beds made me a lil nervous. Once we told the salesman our budget, we went from the $2000 mattresses to the 3-400 models. We found a super comfy pillow top for about $433 shipped with tax and free delivery. This guy was straight and to the point, said he’s been doing it for 18 years and didn’t try to sell us what we didn’t want. I don’t know if it’s a southern / Texas thing but I have a lot more respect when people have that kind of approach. The salesman got our business and my bf paid for the whole thing. Totally unrelated, we have been having issues with gnats and found a giant roach underneath the cat litter box. It freaked me out to say the least, hope the roach doesn’t have any relatives nearby. We don’t leave food out and run a fairly clean house, so I’m a bit perplexed how it even got in the house. Called pest control guy our realtor referred us to and left a message. Hopefully it’s not too expensive for them to come out every few months. Super tight week for me. Between 99 HoA fees coming out, 93 owed to eBay for my laptop sale, food, gas, 150 for furniture, $297 for Verizon I don’t have cash for. Running negative this coming week and looks like a transfer from my Line of Credit will be in short order. Getting paid in 9 days and I don’t’ think cash-only is an option.